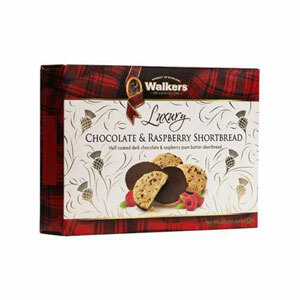 From Walkers of Aberlour, famous for their shortbread, comes the ultimate Scottish indulgence. 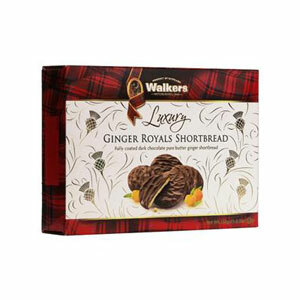 Real pieces of crystallized stem ginger are baked inside each buttery shortbread round, and then rich dark chocolate coats each cookie. The result is addictive - is it candy? Is it a cookie? No, really much more than that. Store in a cool dry place. plain chocolate 50% (sugar, cocoa mass, cocoa butter, emulsifier, soya lecithin, vanilla), wheat flour, butter (12%), crystallized stem ginger (9%),sugar, ground ginger, salt, raising agents (sodium bicarbonate, acid sodium pyrophosphate). These cookies were fresh and delicious. I loved the combination of Ginger and Chocolate!